What is the worst way to end your day? That’s an easy one! Walk out into the rain, after forgetting your raingear to find the back tire is flat. Yeah, we take walk-ins but only cause I know you. Otherwise, sh*t outta' luck.tire is flat. After about 60 seconds of absolute rage. I reached out to some bike friends and found Mr.Will Merry was ready to jump right up. 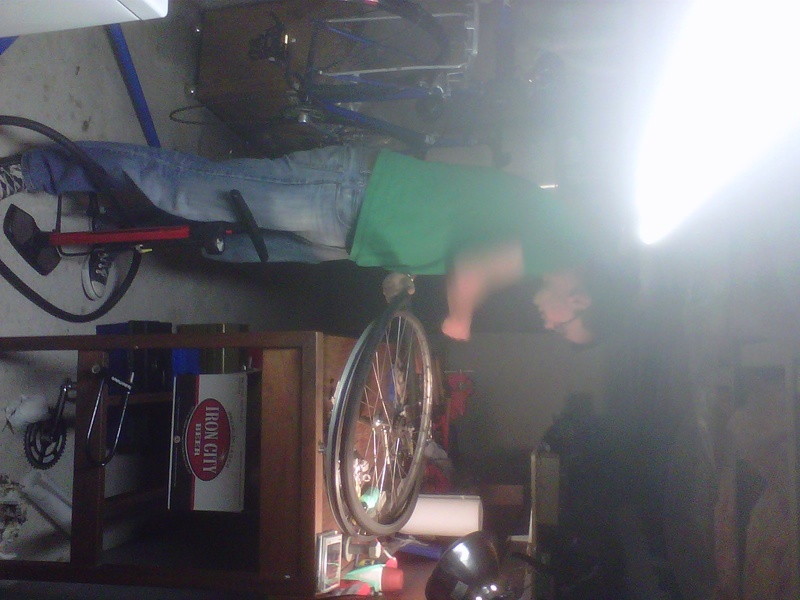 Not only did he immediately take me and my bike in he checked it top to bottom, greased her up and patched my tube. Just fixin bikes like a BOSS! Luv that guy! Lesson to all potential carfree people: Have bike friends like Will! This entry was posted in Bike commute, Car Free, Urban Bike and tagged Bike Maintenence, bike rack, Bike-Friendly, Boston, Car-free movement, CarFreeBrad, CarFreeBrad.com, Clark University, Commuting, Cycling, Worcester. Bookmark the permalink. 1 Response to CarFreeBrad’s Hero!